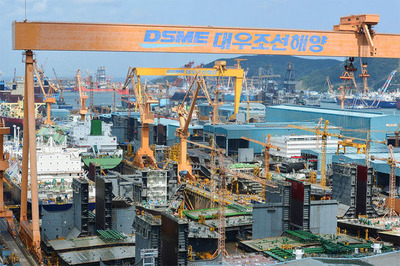 Hyundai Heavy Industries has been chosen as the final bidder to acquire ailing rival Daewoo Shipbuilding and Marine Engineering. The takeover will make the combined firms the world's No. 1 shipbuilder accounting for 21 percent of the global market. State-run Korea Development Bank, which holds a majority stake in Daewoo, said Tuesday that Samsung Heavy Industries informed it that it has no interest in the takeover, which leaves Hyundai the only bidder. KDB hopes to sign the deal after board approval in early March. However, some obstacles remain, chiefly the question whether the resulting behemoth would be too big. It has to be approved by fair trade authorities of trading partners as well as Korea, which will review whether the merged shipbuilder meets global anti-trust regulations. A Hyundai staffer said, "It will take around a year before the merger gains the approval of anti-trust authorities in the U.S., EU, China and Japan." There are concerns that major rivals China and Japan will cry monopoly.